HÀ NỘI — Việt Nam coach Park Hang-seo is determined to top Group A with a win against Cambodia on Saturday at the ASEAN Football Championship. Speaking at a press briefing on Friday in Hà Nội, the South Korean coach said through an interpreter: "Việt Nam have not secured a place in the semi-finals yet so the next match (against Cambodia) is very important. To top the group we’ll have to play well and dominate them all over the field." Park said he had his players to give 100 per cent over the 90 minutes despite the fact they had the advantage of playing at home. "The Cambodians attack well from the midfield. My players will have to play well and stand up for themselves in midfield," said Park, who was not satisfied with his team’s performances in previous matches against weak opposition. Park also praised Cambodia coach Keisuke Honda, a Japanese legend who only took charge of the team recently. "He is one of Asia’s great footballers. I know him very well in person. He has balanced Cambodian football since he started his job there," Park said. Honda will not be present at the game due to club commitments in Australia. Joining Park at the conference, midfielder Nguyễn Quang Hải said: "We have improved a lot in three matches. My teammates and I are in good mental and physical conditions for the game. It is also gives some us confidence to playing at our club’s stadium. We will be going for the best result here." Honda’s assistant Felix Dalmas admitted that history showed Cambodia were at a lower level than the hosts but they were excited to be playing a stronger team after learning from previous matches versus Malaysia and Myanmar. 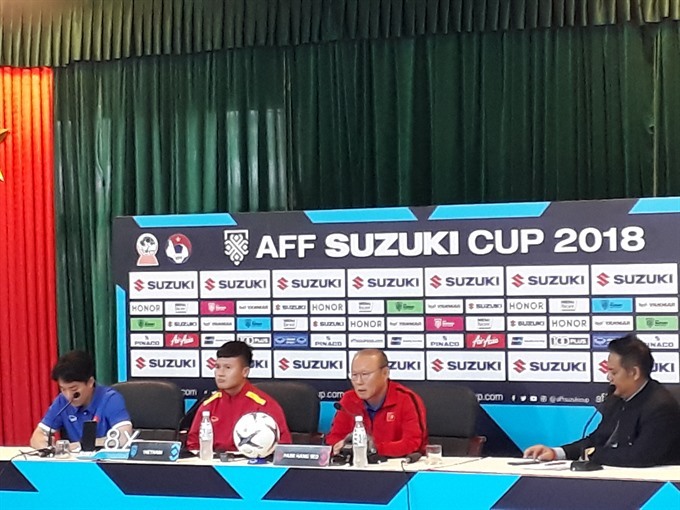 He refused to reveal how they planned to take on Việt Nam, but said the players were improving as the tournament progressed, and they were hoping for a good result. Speaking about Honda’s absence, Dalmas said the Japanese coach was important to the team, and they were keeping in touch on a regular basis. Before flying to Australia, Honda told Kiến thức online newspaper that after their win over Laos he expected the whole team to play with everything they had and a surprise could be on the cards. Việt Nam are currently second in the table behind Myanmar on goal difference. They need one point from the game to advance to the semi-finals, regardless of the result of the match between Myanmar and Malaysia who play at the same time in Kuala Lumpur. In championship history, Cambodia have lost to Việt Nam in all four meetings.